Home of Custom Crome, 1993 NRHA Futurity Champion. Site offers information on breeding, the ranch, and horses for sale. Breeding reining and working horses. Standing Doc N Jose, sire of NRHA Champions and NRHA Bronze winners. Site includes information about the ranch, stallion services and horses for sale. Located in Cave Creek, Arizona. Affiliate of the NRHA, sponsoring a full slate of NRHA Sanctioned shows each year. Standing two NRHA stallions that have produced NRHA Futurity and Reserve World Champions. Reining prospects for sale. Specializing in training reining horses for the NRHA futurity. Horses for sale. Located in Gainsville, Texas. We offer quality training ,breeding and sale of reining horses .Mike is also reputable NRHA judge .Our site includes broodmares on the ranch and prospects to show horses for sale. Standing NRHA World Champion and USET medalist Freckles Top Prize. Site includes photos and accomplishments, and offers horses for sale. NRHA Open Futurity Champion stands stallions and offers prospects for sale. Located in Pilot Point, Texas. Standing NRHA Futurity Champions, Mr Melody Jac and Brennas Kid. Site offers information on the stallions, the farm and its staff, and horses for sale. Horse training by a leading NRHA rider. Site includes training tips and business consultation services. Located in Pilot Point and Aubrey, Texas. Standing NRHA Futurity Champions, Mr Melody Jac and Brennas Kid. Site offers information on the stallions, the farm and its staff, and horses for sale. Located in Maple City, Michigan. Reining horse training by NRHA judge. Stable stands stallions at stud, offers horses for sale and hosts reining clinics. Affiliate of National Reining Horse Association (NRHA). Information on upcoming competition and events, membership, and links. Includes sales list with photos and profiles of horses. Offers icelandic and paint horses for sale also. Provides breed histories for American Paint Horses, Quarter Horses, and Icelandic Horses. Includes sales list with photos and profiles of horses. Offers icelandic and paint horses for sale also. Provides breed histories for American Paint Horses, Quarter Horses, and Icelandic Horses. Located in Coldstream, British Columbia, Canada. Horses, Paint Horses, Quarter Horses, Stallion, Foals, Performance Horses. Pictures and accomplishments of broodmares and show horses. Horses for sale. Located in Moses Lake. Specializing in starting reining horses. Horses for sale. Located in Moxee, Washington. Quarter horses and paint horses. Offers photos of winners, broodmares, and horses for sale. Breeding color performance horses. Stallion services and horses for sale. Offers photos of horses and includes horses for sale. Located in Parachute. Offers training for horses and riders, and horses for sale. Located in Carbon Hill, Alabama. Breeding halter and performance horses. Contains pictures, a barn cam, horses for sale, and pedigree details. A family run business selling competition horses and Hunters for over 30 years, specializing in event horses, Hunters, and Jumpers. Features descriptive list of horses with photographs and an online request form. Located in Allexton, Rutland, England. If the business hours of Quarter Mount Farm in may vary on holidays like Valentine’s Day, Washington’s Birthday, St. Patrick’s Day, Easter, Easter eve and Mother’s day. We display standard opening hours and price ranges in our profile site. We recommend to check out customcrome.com for further information. 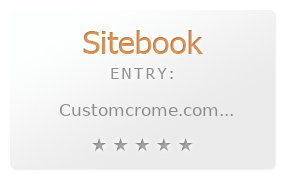 You can also search for Alternatives for customcrome.com on our Review Site Sitebook.org All trademarks are the property of their respective owners. If we should delete this entry, please send us a short E-Mail.